Building an online store requires a great deal of effort and time. However, while many merchants take days to improve the UX of every part of their sites, some just decide to skip out on such crucial thing: the product description. At first glance, explaining a product is not that of a big deal. However, it could make or break your stores. The descriptions reflect your value propositions. They not only tell the customers all those amazing benefits of your item but also the reasons why they should buy it from you. 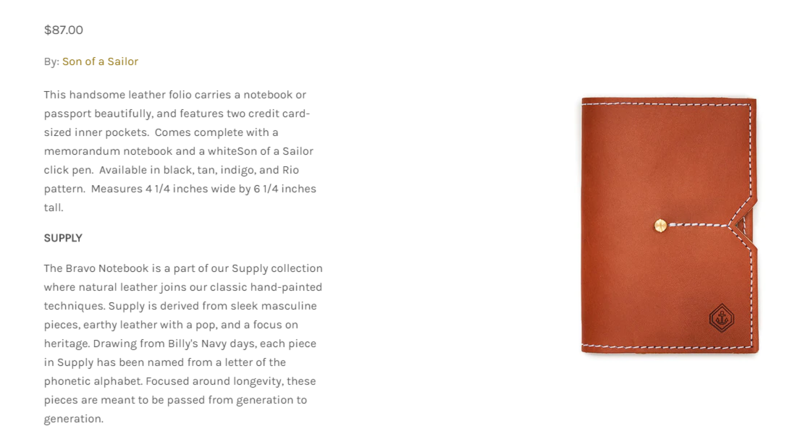 eCommerce copywriting is powerful. It is something you should invest your time in, not neglect. A good description could tell all the information the customers need to make a purchase. It also differentiates your store from other competitors. Still, not everyone has good skills in eCommerce copywriting, and most do not have the resources to hire someone to do the work. So in this blog, we will give you 6 tips on how to write killer descriptions that sell like crazy. Follow this basic guide, add your personal style, then you are good to go. The first step of making the description that sells is always learning about the customers’ insights. Each segment of the audience has different interests and backgrounds. If you can understand what they think and how they act, you can persuade them to purchase. What are the product’s basic details? Where would someone use your product? When should someone use your product? All these points are the basic information your audience needs. It is not that you have to write down everything. If the customers are familiar with your brands or your products, the answers could be much transparent. You just have to choose the most valuable information, like which benefits are most appealing and relevant to the visitors, then do your writing. Take a look at the above example. This is the description of Apple’s MacBook. It’s merely the details about the product configurations because the majority of their targeted audience is the tech-savvy ones. They are well aware of how the MacBook works, not to mention Apple is a huge international brand that most people acknowledge of their inventions. In addition, Apple also created a special landing page to tell all the products’ benefits and features. Explaining much about the MacBook is unnecessary then. 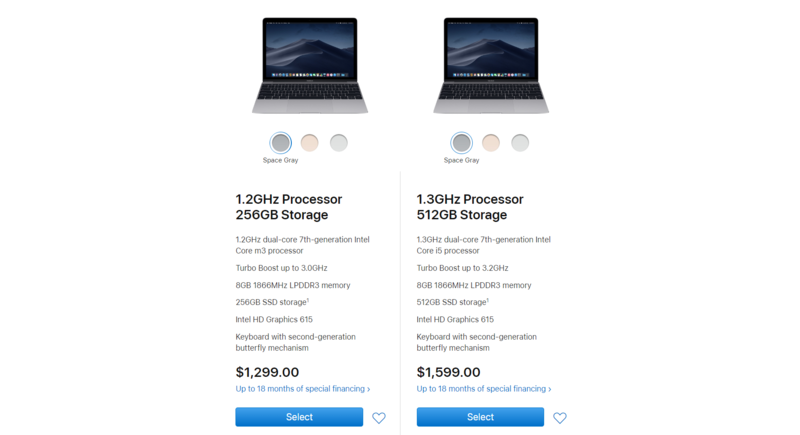 The technical specifications and pricing are enough in this case. However, if you think that your audience needs additional information to understand your products, then you’d better explain yourself clearly. Check out below example from Wayfair. Besides providing additional details about weights, dimensions, and specifications, they demonstrate clearly who the product is for and how it works for them. 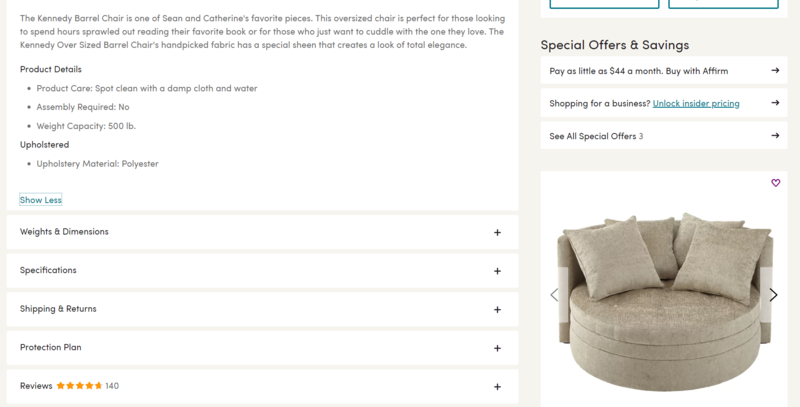 “Perfect for those who just want to cuddle up with the one they love” – Wayfair gave out such a visual explanation. The readers could even immediately imagine themselves chilling on the chair on a lazy Sunday with their beloved ones. The lesson learned is to always think from the customers’ perspectives. Brainstorm what information they need, and what would motivate them to buy. If you understand your customers, then you can create persuasive descriptions. It works for every type of eCommerce copywriting, not just the description. When you sell your own products, you may get over-excited by showing off all the product’s features. However, let’s face the truth that the customers may not be that interested in those details. In fact, “what’s in it for me” is the crucial question that drives most shoppers to the purchasing decision. As the personal context is usually the first filter people use to evaluate a thing, what the customers care about is not the amazing specs of your product, but how its features benefit them. For example, Under Armour did a good job in describing the make and fit of their shirt, including the benefits of each feature. They could have just said “HeatGear fabric” but it would not be as effective. They directly pointed out the advantages of “extreme comfort with very little weight” for the customers. And that is how they differentiate themselves from their competitors and give shoppers the reasons to purchase gym shirts from them. The tone of your writing is one of those elements that define your brand. If your business is targeting the young with a fresh and party vibe, then the corporate writing style could kill the spirit. The product description should stay consistent with everything else on your web and reflect your branding image as well. 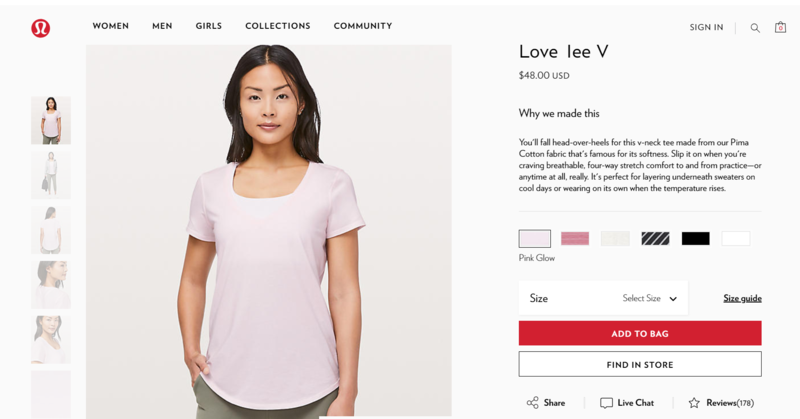 Take a look at Lululemon’s writing tone. The shop is selling yoga clothes and running gear. Everything on the website is inspiring with a gentle and positive aura from the design with subtle colors to the short but sweet descriptions. The writing is much calming and adoring, which reminds us of the nature of yoga. But if you look at Versace bag’s description, the tone is all about quality. They use words like “timeless”, “exceptional”, and “one-of-a-kind”. All these powerful words reflect the luxury and top-notch quality of the product. Yes, it’s exactly what we expect from a $1,995 bag. In fact, the customers hardly read your descriptions thoughtfully. Most of them just scan for the key details of the products. So it is recommended to keep the descriptions short and sweet. Innocent Drinks makes sure that the description is on point. Think about it! It is not that necessary to write a long paragraph to describe a bottle of orange juice. Instead, they focus on their values, rather, what makes their drinks different with a bullet list. Using the list is a good way to make the key features much noticeable. The bullet list works even better for products that need further details also. Isn’t it the best way to help the customers scan and catch the information they need? Take a look at The Iconic. Clothing brands mostly use images as their most powerful descriptions. However, the customers also need information like materials, sizes, or design. These details seem “boring” at first glance, but they are needed. In case you worry that using a few words cannot impress the customers, then you’d better choose more dynamic words. Remember the above case of Versace? They don’t write a long description, but their writing is much powerful with terms like “iconic” or “exceptional”. This is a list of 400 words to amp up sales you should check out. Research has proved that if people hold a product in hands, their desire to own it increases. Then what’s about the case of eCommerce? Unlike brick-and-mortar stores, online shops cannot let web visitors touch their physical products. However, you can use tricks as storytelling to trigger the customers’ imagination, motivating them to purchase your items. Reading this, customers can imagine the thought and care about making this notebook, and as a result, get the sense of long-lasting quality from it. It is not something you could inspire people just with plain claims like “the notebook is in high quality”. And the last tip is, just don’t forget about SEO. It’s one thing to write a killer copy, it’s another thing to make your products appear on the search engine result pages. If your customers can’t find your products, then your effort is most likely go to waste. Therefore, before you write the product description or create the product page, make sure to do some keyword research. This approach cannot guarantee that you would get a high ranking in Google search results. SEO is much complicated that you need different tactics to get a positive impact. However, it worths a try. The product description is easily neglected, especially if you are running a drop shipping business that you have hundreds of products and little time for creative writing. However, if you take some time to create compelling and informative product descriptions, you can make significant changes in your sales and nurture better relationships with your prospects.